(Photo: Reuters / Mike Hutchings)Anti-apartheid activist Mamphela Ramphele launches her new political party "Agang" to challenge South Africa's ruling African National Congress (ANC) in Pretoria, June 22, 2013. She said the new party, named after the Sesotho word for "Let us build", will contest in elections due early next year. Mamphela Ramphele a former World Bank managing director and the partner of murdered anti-apartheid activist Steve Biko has formally launched a new political party in South Africa to challenge President Zuma's African National Congress (ANC). "The leaders of this current government set an appalling example that others follow," said Ramphele in Pretoria on Saturday, "They seem to think they are beyond the reach of the law. "One by one they have systematically attacked the very foundations of our constitutional democracy, the judicial system, the freedom of the press, accountability of government and the human rights of all citizens." Retired Archbishop and Nobel Peace Prize laureate Desmond Tutu welcomed Ramphele's entry into politics the day before she launched the party. "Few thinking South Africans would not welcome the entry into South African politics of someone of the calibre, background, intellect and resourcefulness of Mamphela Ramphele," he said in a statement. "Nearly 20 years into our democracy the graciousness and magnanimity that characterised our political firmament have to a great extent been surrendered at the altar of power and wealth," said Tutu. Ramphele had said that Agang - which means "build" in Sepedi, one of South Africa's 11 official languages, will create more jobs and hold leaders to account. A qualifiied medical doctor, she believes her party can bring the ANC's share of the popular vote to below 50 percent from the mid 60s where it now lies. In May Tutu, who symbolized the struggle against apartheid almost on a par with fellow laureate Nelson Mandela, said he will no longer vote for the ANC, the party that has ruled the new South Africa since 1994. "I'm not a card-carrying member of any political party. I have over the years voted for the ANC, but I would very sadly not be able to vote for them after the way things have gone." Tutu strongly criticised the ANC and Zuma corruption and of failing on promises for a betterment of life for South Africa's poor. "We really need a change," Tutu wrote in an opinion piece in South Africa's Mail and Guardian Newspaper. "If Dr. Ramphele formally enters the election race next year, and goes on to attract sufficient votes to become a parliamentarian, there is no doubt that South Africans will benefit from her experience and her knowledge, and from hearing her voice." He said a strong constitutional democracy was strengthened by the presence of vibrant and credible opposition. 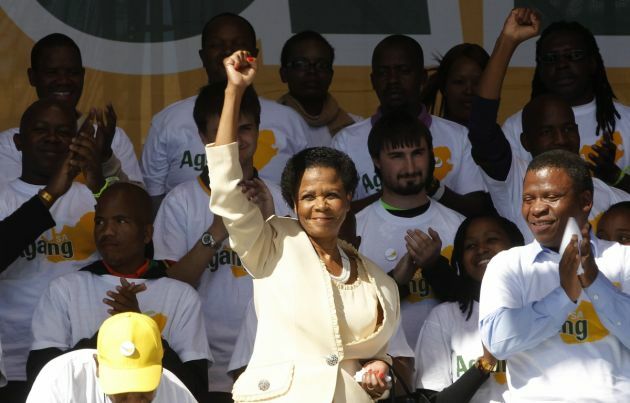 Ramphele's political platform Agang was officially launched as a party in Pretoria on Saturday. Tutu said that although Ramphele criticised the ANC, as he had done, this did not mean she did not love her country or should lose the right to speak. "Dr. Ramphele has spoken of a pervasive climate of fear and intolerance in South Africa, where critics restrict their criticisms to their armchairs behind closed doors rather than risk their capital or their connections or their clout. "If we have indeed become a nation that fears the consequences of not kow-towing to the government we have clearly taken a wrong turn somewhere," he said. The main opposition part in South Africa is the Democratic Alliance led by Helen Zille, who was a journalist and anti-apartheid activist. Ramphele says the DA carries too much "baggage" of the past, probably a reference to the fact that many in the white minority vote for the party although its black support is growing rapidly. The ANC seeks to label the DA as a white party, although the apartheid National Party merged with the ANC after 1994 and its last leader is in Zuma's cabinet. The Agang party leader was once the head of the University of Cape Town, one of the country's top institutions and she says the government is ignoring education. "The weakest ministers are chosen to lead our Department of Education, and I'm sure I don't have to mention names," she said. "Only 10 percent of our born-frees have done well enough to get into university, and in the 20 years since the end of apartheid, our government has not addressed the key issue, which is poor quality of teachers and teaching standards." "Born-frees" is the name given to those born after apartheid was dismantled in the 1990s and this group of voters is being viewed to any changed in the political landscape. In 2008 a group broke away from m the ANC to form the Congress of the People (COPE) but the party has yet to become a major political force.